Follow Man City v Arsenal here. Watford XI: Gomes, Prodl, Cathcart, Britos, Anya, Abdi, Suarez, Watson, Jurado, Ighalo, Deeney. Right, thanks for you company and that, as they say, is that from Anfield. Liverpool's last home game will be against Chelsea on Wednesday. "Kevin Stewart has been fantastic, very composed. He's dictated a lot of the play and it's been a very mature performance." Cameron Brannagan delivers an enticing cross for Christian Benteke at the far post but the Blegium striker gets his timing all wrong and sends his header over. There'll be three minutes of added time at Anfield. A Jordon Ibe effort hits the post after good work from Roberto Firmino. You've always got to hope but Watford fans might be stuggling for some considering the Hornets have scored just 12 Premier League goals in 2016, a joint-league-low with Villa. Christian Benteke just cannot buy a goal at the moment. He's played in by Joe Allen but his shot is palmed away by keeper Heurelho Gomes. "Firmino picked it up, got the ball under control and away he went. That was special. "Liverpool needed that - they've not played so well in this second half. "Watford have made life difficult for the hosts but there is a distinct lack of quality in their side." Odion Ighalo has another chance for Watford and puts his shot into the side-netting. Some Watford fans cheer thinking it's gone in but - I'm afraid for them - it's not. Roberto Firmino looks like he's wrapped up the three points for Liverpool. The Watford defence stand off him as he runs at the visiting goal and he takes advantage by driving in a shot which keeper Heurelho Gomes will be disappointed he didn't save. "This is a little bit scrappy. Some of these players haven't played much recently so won't be as sharp as we'd all like. "Mind, you can still put in 100% effort. Especially if you're fighting for a starting spot in a Europa League final..."
Watford are picking up the pace. Troy Deeney finds Steven Berghuis and his shot is saved by keeper Simon Mignolet. Dangerous for Liverpool. Joe Allen is penalised for a foul on Almen Abdi just outside the box in a central position. Abdi picks himself up to take it but sends his effort over. It wasn't that bad a strike but he's immediately substituted for Nordin Amrabat. Watford manager Quique Sanchez Flores appeared set to substitute Odion Ighal before his recent chance but replaced Jurado with Steven Berghuis instead a few minutes ago. Liverpool boss Jurgen Klopp brings on Roberto Firmino for Philippe Coutinho. Could this man be about to come on? Watford might hope not. Great chance for Odion Ighalo. The Watford striker collects an Ikechi Anya pass after a Troy Deeney dummy, leaves Alberto Moreno on his backside with a sidestep but his shot is saved. Coutinho and Benteke quickly combine again and this time the former's shot is on target but easily saved by keeper Heurelho Gomes. Christian Benteke squares the ball for Philippe Coutinho and it seems the Brazilian is set to sidefoot in for the home side but he can only make glancing contact - a good chance goes begging. 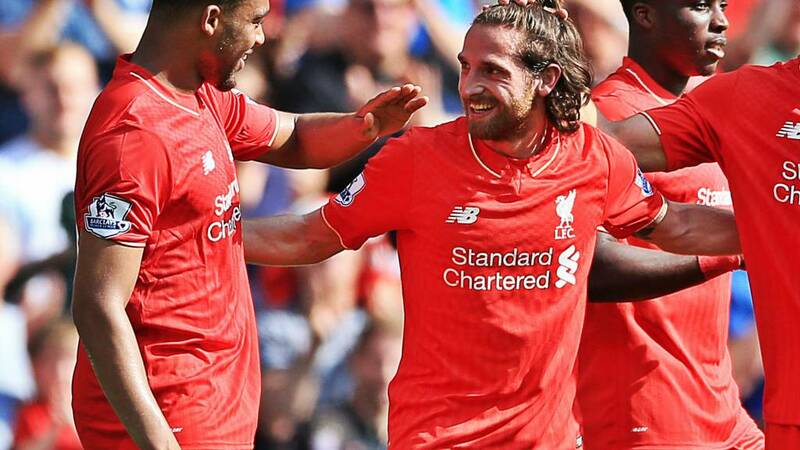 Joe Allen (24) was rewarded for his run from midfield as he met Christian Benteke's (9) knock-down from Philippe Coutinho's (10) ball into the box.